That is just as reasonable a guess as any of the others. Territorial 2nd L/Ts OSD collar and large pips. 1st Bn Sergeants Mess dessert spoon. 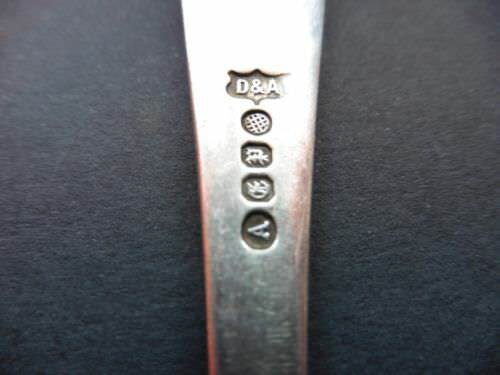 By Thomas Daniel & Thomas Arter, 'A' grade electroplate with hatched globe trademark post 1882. Permanent pass issued to Pte Skinner 2nd Bn The Black Watch R.H.R. You will notice the badge depicted on the front matches the 1st pattern adopted by the Bn in 1881. At this date the Bn was at Malir barracks Pakistan. 1st Fifeshire rifle volunteer Corps ORs WM helmet plate 1880-87. HQ at St. Andrew's. Became 6th (Fifeshire) VBRH in 1887, and 7th (TF) RH Bn in 1908. Three pinched lugs to the reverse. QE11 Territorial Officers shoulder belt plate circa 1960s. 3x4 inch rectangular gilt plate with seeded ground and burnished raised edge. Mounted to the plate a S/P star (now tarnished), mounted on the star a bright gilt crown and wreath no Sphinx battle honour. Mounted to the centre of the oval a silver St. Andrew. Usual hook and stud fittings to the reverse. Rare combination arm badge removed from uniform. 10th Bn Black Watch, 144th Inf Brigade, 48th (South Midland) Division, badge worn July 44 to Aug 45. Black Watch tartan badge above a dark blue red eyed macaw on a red diamond. The parrot was a resident in the house used by the Division HQ. When the commander walked into the room the parrot shouted "Good Luck", it was then adopted as the divisional sign. The 10th Black Watch raised in Brechin in 1940 joined the 48th Div in July 1944, it acted as a training Bn for the provision of overseas reinforcements. Fine officers silver collar badge converted for wear in the sporran. Ref your post of 27 May 2014, Cameron's pattern badge. Harry Southgate aquired this badge from myself in the mid 1980's. It was one of six which came from the Edinburgh makers archives along with various Fife R V C pouch badges some of which were unfinished. Unfortunately the pouch badges have been re-struck for years. The late Jimmy Wilson had an image from the Dunfermline Press showing five 1860 privates from Limekilns wearing shakos with this badge. Presumably the were members of the 1st Dunfermline Coy. I am afraid the photocopy he gave me is now lost. In the early 1980's Phillips Glasgow sold a mint officer's shako with a silver Cameron's badge. The badge had dark blue velvet behind which was cut to the outer edge. Thank you for that information it all adds to the provenance of the badge, do you know the name of the Edinburgh maker? Also do you still collect?